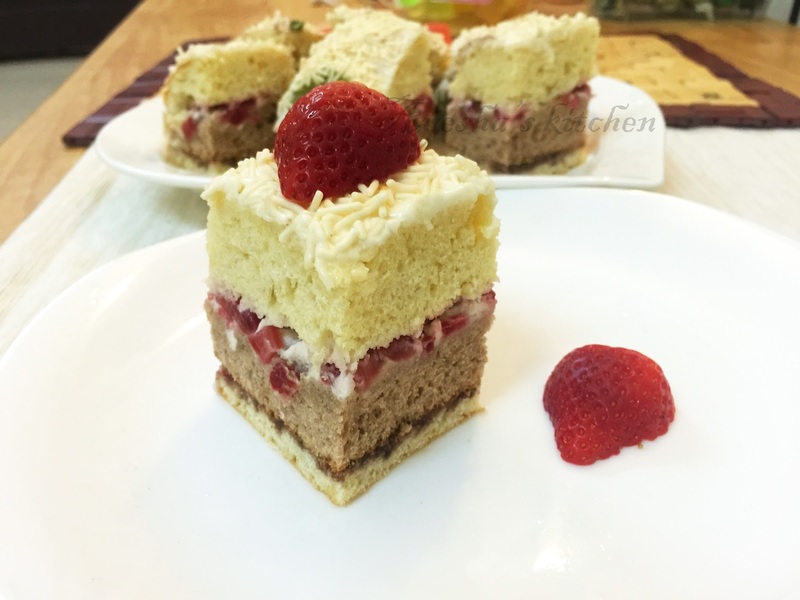 Here am going to share with you a simple , gorgeous, and yummy fresh strawberry filled vanilla chocolate cake recipe. This is not one of those beautifully decorated cakes but for me the taste always comes first and this cake definitely has that. Strawberry, my kids favorite fruit. Do you know the outstanding nutrients in strawberries? They are excellent source of vitamin c , dietary fiber, manganese, iodine and much more. Thats why i love strawberry desserts and strawberry recipes which i used to include in most of my desserts and puddings. Actually i was planned to make a vanilla cake with strawberry filling. But my daughter asked me to bake a chocolate cake for her with strawberry filling and which inspired me to make this wonderful lovely and yummy cake. The chocolate and vanilla flavor with the goodness of strawberry made this cake a heavenly delicious . 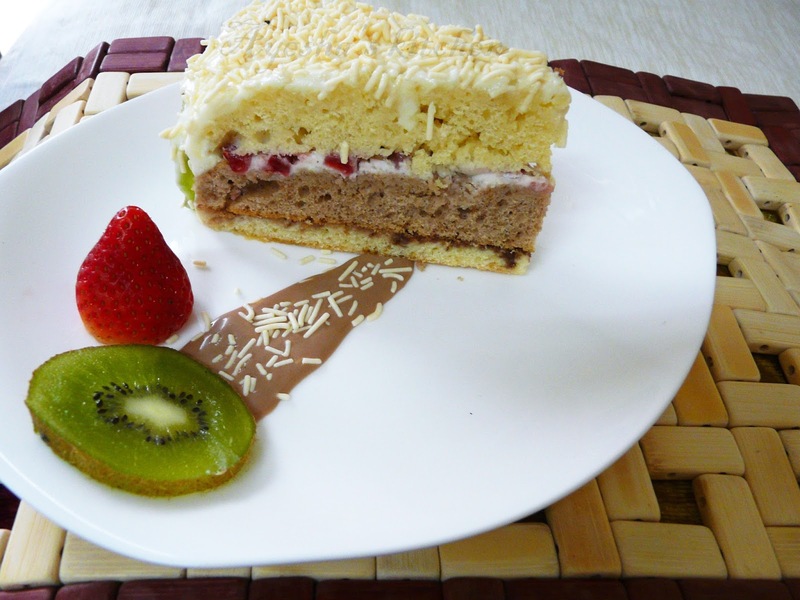 So lets see how to make simple layered cake with fruit filling. Hope i can explain the recipe in detailed ,which i specially done for the beginners in baking. So don't get panic on seeing the length of the recipe This is a must try cake recipe and please drop your valuable comments . Enjoy!!! Grease the pan with butter and dust some flour over it and remove the excess. Just keep this ready. Now take a bowl and beat the eggs and powdered sugar using beater until fluffy and soft. Sift together all purpose flour and baking powder well.Add this sifted powders little by little to the egg mixture and keep on folding until the whole flour is mixed up with the egg mixture. Add vanilla essence and fold it well. Pour the batter in the greased dusted baking pan. Shake and tap the sides of the pan, so that air bubbles are released. Bake it for 20 - 25 minutes ( insert a toothpick and check whether it comes out clean). Once done, let the cake rests for 10 minutes at room temperature before frosting. Once cooled, divide it into 2 layers. ( all the ingredients and preparation are same as above vanilla cake. But should add melted chocolate or cocoa powder along with the ingredients. Now take a bowl and beat the eggs and powdered sugar using beater. Sift together all purpose flour and baking powder well.Add this sifted powders little by little to the egg mixture and keep on beating until the whole flour is mixed up with the egg mixture. Add melted chocolate or cocoa powder and beat again. Keep the mixing bowl, wire whiskers and hand whiskers in the freezer for 20 minutes. Keep some ice cubes in the freezer for keeping it under the bowl which is used for whisking the cream . If everything set, then pour 1 cup of whipping cream, vanilla essence and icing sugar in the glass bowl . Set some small ice cubes under the glass bowl. Whisk it well until soft peaks formed. Place a vanilla cake layer on a cake plate. Spread some chocolate melted or cream icing over it. Now place the chocolate cake ( not divided) over it and again spread some cream frosting, then spread chopped strawberries and then finally place the other layer of vanilla cake . Spread top and sides of the cake with the remaining frosting. Top with some vanilla vermicelli and the sides with some kiwi slices.